ApexNetwork Physical Therapy has physical therapists trained in golf performance and rehabilitation who know how to alleviate your aches and pains related to golf or even just get you in better golf shape. 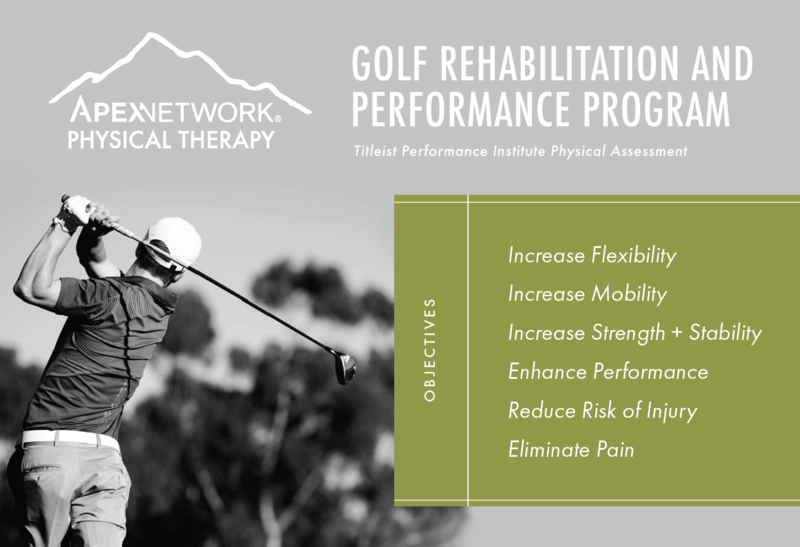 Our customized rehabilitation program utilizes the Titleist Performance Institute (TPI) screen, which specifically identifies physical limitations related to the golf swing and addresses these deficits with a customized exercise program. Our customized rehabilitation program focuses on increasing flexibility, increasing mobility, increasing strength and stability, enhancing performance, eliminating pain and reducing the risk of injury to keep you on the course. Our physical therapists have extensive orthopedic backgrounds and are experienced in working with a wide variety of athletes, including those at the collegiate and professional levels. What is Titleist Performance Institute? TPI is the world’s leading educational organization dedicated to the study of how the human body functions in relation to the golf swing. Through endless research on professional and amateur golfers, TPI has discovered how a properly functioning body allows a player to swing a golf club in the most efficient way possible. They have identified most common swing characteristics that can lead to mechanical inefficiencies in your golf swing and put you at greater risk for injury. With a TPI Medical Certification, this gives medical professionals the ability to assess golf-specific injuries and establish rehabilitation techniques to improve player performance and reduce injury/pain. Currently, this service is only offered at ApexNetwork Troy, IL and ApexNetwork Sierra Vista, AZ. Golfers, go see Cory in Troy! I learned a great deal about the mechanics of the golf swing from Cory, and he can assist you with prescribed exercises to target mobility/strength limitations you may have.